In Italian the Leaning Tower of Pisa is Torre pendente di Pisa. It was built as a freestanding bell tower for the cathedral in Pisa. On the side where the tower is lower because of the lean it stands at 187.27 feet. On the high side of the tower it stands at 186 feet. The tower weighs about 14,500 tons. That's a lot of weight for a building to have to support when it has been leaning since it was built. There are approximately 294 steps on the north side and 296 steps on the south side of the tower. The Leaning Tower of Pisa took 344 years to build, beginning in August 1173. It began to lean in 1178 once construction on the second floor had begun. The lean was due to one side sinking into the soft ground. The construction was stopped twice, the first time for 100 years, the second time in 1284. Both times it was due to wars. If it hadn't been for the two pauses in construction it would have taken between 185 and 195 years to complete. Inside the tower there are seven bells. Each bell represents one note of the musical major scale. The first stones used to form the base of the Leaning Tower of Pisa were purchased with the money left to the Opera Campanilis petrarum Sancte Marie by Donna Berta di Bernardo in 1172. Nobody seems to be able to pinpoint the identity of who the actual original architect really was. There are other towers in Pisa with the same tilting problem, but not as noticeable. Throughout its history, the tilt of the tower has gradually gotten worse, about 0.25 inch (0.1 cm) every year. It was closed to the public in January 1990, because the structure was dangerously close to collapse. For much of the 1990s the tower was wrapped in steel and anchored by steel suspenders holding it in place. Soil was carefully removed under the tower to even the land underneath. In June 2001, engineers announced that the Leaning Tower was "secure," and although the lean is still apparent, it is 17 inches (44 cm) less than it has been for 150 years. During World War II, the Allies heard that Germans were using the Leaning Tower of Pisa as an observation post. Once the Allies saw how beautiful the tower was they refrained from destroying it. The Leaning Tower of Pisa became a UNESCO World Heritage Site in 1987. Also included in this designation were the cathedral, cemetery and the baptistery. In 1989 another tower called the Civic Tower of Pavia collapsed. This sped up the restoration efforts for the Leaning Tower of Pisa. The tower was closed to the public from 1989 until 2001, after the restoration was complete. It is thought that the restoration will keep the Leaning Tower of Pisa stable for at 300 years more. In 2008 engineers stated that the Tower had stopped moving. This is the first time in its history that it has not been slowly leaning further to one side. If the construction of the tower had not been halted the first time due to war it would have toppled over. The hundred years it had to sit helped to let it settle (compact). The Leaning Tower of Pisa is a circular shape and has eight floors. The 7 bells are located on the eighth floor. Some people have suggested that the tower should be straightened. 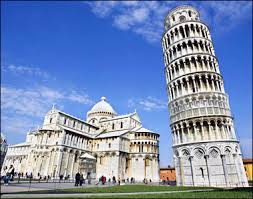 The people have Pisa had said they would rather see it fall over than be straightened.